This will be a relatively short post. 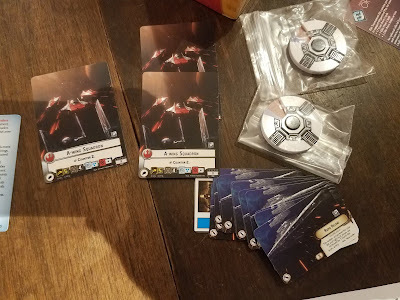 Over the weekend, my friend talked me into playing in a Star Wars Armada event. There were only four participants, so it went pretty quick. I had my buddy make a list for me and explain how to fly it. Shockingly, I came in second place. I would have come in first, but my buddy absolutely crushed a guy last round and took top place. We got pretty cool official acrylic round counters as prizes, along with some alt artwork cards. I might end up playing in another couple of tournaments this summer.